Kalank releases to 4000 screens in India, widest release of 2019 so far. Alia Bhatt- Varun Dhawan starrer pre-independence romantic drama Kalank finally released in theatres today. The movies with its larger than life sets and visually enticing song and dance sequences have already created a positive buzz around it. Sanjay Dutt, Madhuri Dixit Nene, Alia Bhatt, Varun Dhawan, Aditya Roy Kapur and Sonakshi Sinha will be seen playing pivotal roles in the period drama. While we know nothing of the plot yet, the film seems to revolve around the story of star-crossed lovers, played by Alia and Varun. The film is produced by Karan Johar' s Dharma Productions and directed by Abhishek Varman. Filmmaker Shashank Khaitan who directed Alia and Varun in Humpty Sharma ki Dulhaniya said, "@aliaa08 and @Varun_dvn are superb... their eyes speak a thousand words. Their chemistry is electric. Be it Love or Loss, they turn everything into MAGIC "
In another tweet he said, "Kalank is a visual treat ... Its beautiful and Cinematic... its a fantastical world with a real heart... #AbhishekVerman super job Abhi... #AdityaRoyKapur is superb in the film ...@sonakshisinha is so good in a lovely cameo.."
Singer and actor Sophie Chaudhury said, "Mesmerised by the magic of #Kalank ! @aliaa08 we know ur an incredible actor & in this ur beyond beautiful too! @Varun_dvn the blood,sweat & tears u put into Zafar shows..ur outstanding!Loved Adi & look out for @kunalkemmu "
Filmaker Milap Zaveri said, "#Kalank is an epic SAGA directed like an auteur by @abhivarman His vision is HUGE! @Varun_dvn is EXTRAORDINARY! Ekdum FIRST CLASS! @aliaa08 is DIVINE! Aditya is BRILLIANT! @sonakshisinha wins and breaks your heart! Bravo @karanjohar Sajid bhai @FoxStarIndia What DILDAAR producers"
Actress Neha Dhupia tweeted, :Loved every character of this classic romance @MadhuriDixit so graceful #SanjayDutt so powerful,Adi n @sonakshisinha so gorgeous @kunalkemmu so impactful n the ones I could nt take my eyes off @aliaa08 @Varun_dvn .Congrats Abhi @karanjohar @apoorvamehta18 u ve a winner!" #kalank ..Loved every character of this classic romance @MadhuriDixit so graceful #SanjayDutt so powerful,Adi n @sonakshisinha so gorgeous @kunalkemmu so impactful n the ones I could nt take my eyes off @aliaa08 @Varun_dvn .Congrats Abhi @karanjohar @apoorvamehta18 u ve a winner! 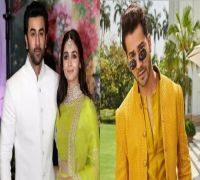 Kalank's fourth song 'Aira Gaira' starring Kriti Sanon, Varun Dhawan, Aditya Roy Kapur out now!